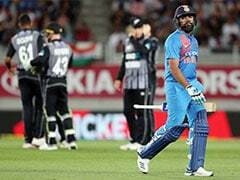 Highlights India vs New Zealand 2nd ODI: Rohit Sharma and Shikhar Dhawan stitched a 154-run stand to help India post a strong total. Highlights Between India vs New Zealand 2nd ODI, from Bay Oval, Mount Maunganui. 14:33 IST: That brings an end to the second ODI between India and New Zealand at Bay Oval. Thank you for joining us for the live coverage. 14:28 IST: India beat New Zealand by 90 runs to take 2-0 lead. Yuzvendra Chahal claims the final wicket for India. Lockie Ferguson departs for 12. 14:25 IST: Trent Boult begins with a four and a six to take New Zealand to 234/9 in 40 overs. 14:24 IST: Trent Boult, the last man, comes to the crease. 14:22 IST: WICKET! Bhuvneshwar Kumar gives India a much-needed breakthrough, dismisses Doug Bracewell for 57. New Zealand are 224/9 in 39.2 overs. 14:19 IST: FOUR! Inside edge but a boundary for Lockie Ferguson. Kuldeep Yadav concedes six runs in the final over. New Zealand are 224/8 in 39 overs, need 101 runs to win. 14:17 IST: Kuldeep Yadav to bowl his last over of the spell. Can he claim a five-wicket haul? 14:13 IST: FOUR! Another good shot and another boundary for Doug Bracewell. That brings up 50-run partnership between Bracewell and Lockie Ferguson. 14:11 IST: FIFTY! Doug Bracewell scores his maiden ODI half-century off 35 balls. He scored four boundaries and three sixes to reach the 50-run mark. New Zealand are 212/8 in 36.5 overs. 14:07 IST: SIX! Sweet connection. Doug Bracewell slogs it hard to send it across the fence at deep mid-wicket. He is trying his best to bring New Zealand close to the target. 14:05 IST: FOUR! Brilliant cover drive by Doug Bracewell. Now, this is his career-best in the One Day International cricket. 14:03 IST: FOUR! A short ball from Kuldeep Yadav and Doug Bracewell hits it hard over the mid-wicket for a one-bounce four. 13:59 IST: SIX! That's huge. Doug Bracewell predicts the bounce and lofts it over the mid-wicket for maximum. New Zealand are still 148 runs away from the target. 13:55 IST: Kuldeep Yadav misses out on a hat-trick. But can he claim a five-wicket haul? 13:54 IST: Lockie Ferguson comes to bat at number 10. 13:53 IST: WICKET! Ish Sodhi departs for golden duck as Kuldeep Yadav claims wickets on consecutive deliveries. New Zealand reeling at 166/8 in 30.5 overs. 13:52 IST: Ish Sodhi comes to the crease. 13:51 IST: WICKET! Third wicket for Kuldeep Yadav. Henry Nicholls departs for 28 as Mohammed Shami takes an easy catch. 13:48 IST: End of the over! Eight runs from the over by Yuzvendra Chahal. New Zealand are 165 for six in 30 overs, 160 runs away from the target. 13:46 IST: Yuzvendra Chahal comes back into the attack. 13:40 IST: FOUR! Henry Nicholls pulls it to deep backward square leg where Vijay Shankar fails to stop the ball despite a gritty dive. 13:38 IST: Doug Bracewell comes to the crease. 13:36 IST: WICKET! 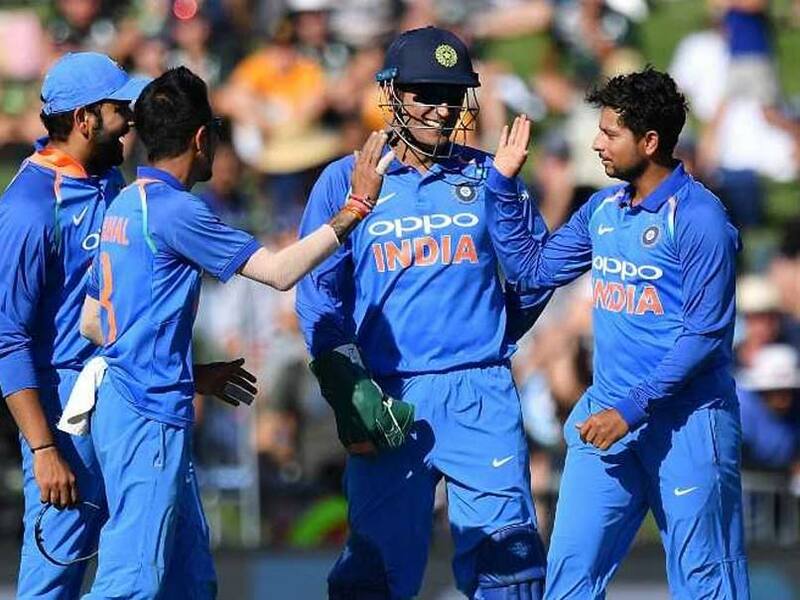 Kuldeep Yadav claims his second wicket as Ambati Rayudu takes a remarkable catch at deep mid-wicket to dismiss Colin de Grandhomme for three. New Zealand are 146/6 in 27 overs, need 179 runs to win. 13:32 IST: FOUR! Sweetly placed. Henry Nicholls plays a late cutter to get a boundary. 13:30 IST: Bowling change! Mohammed Shami is back into the attack. 13:28 IST: Colin de Grandhomme comes to bat at number seven. 13:26 IST: WICKET! Kuldeep Yadav claims his first wicket in Tom Latham. Latham departs for 34, leave New Zealand at 136/5 in 24.3 overs. That brings an end to the 36-run partnership between Latham and Henry Nicholls. 13:23 IST: SIX! That came out of the middle of the bat. Tom Latham predicts Kedar Jadhav's low bounce well in advance and lofts it over the mid-on for a six. 13:21 IST: A loud shout for LBW appeal against Tom Latham falls on deaf ears. 13:18 IST: End of the over! Just three runs from the 22nd over by Kedar Jadhav. New Zealand are 120/4, need 205 runs to win. 13:13 IST: Kuldeep Yadav comes into the attack. He claimed four wickets in the first ODI as India wrapped up New Zealand for a paltry 157. 13:08 IST: FOUR! Beautifully placed by Tom Latham. He sweeps it down the fine leg to get a boundary, takes New Zealand to 108/4 in 18.2 overs. 13:05 IST: Henry Nicholls comes to the crease. 13:04 IST: OUT! Stumped. Ross Taylor departs for 22. Kedar Jadhav claims his first wicket as MS Dhoni does his magic from behind the stumps. New Zealand are 100 for four in 17.1 overs, 225 runs away from the target. 13:02 IST: Review for stumping. Ross Taylor is the man in question. 12:56 IST: 100 up for New Zealand in 16.5 overs. Ross Taylor takes a single to help the home team reach the triple figures at Bay Oval. 12:53 IST: FOUR! Tom Latham finds the gap through the mid-wicket, guides the ball across the fence to get a boundary. 12:49 IST: Tom Latham comes to the crease. 12:47 IST: WICKET! Colin Munro departs for 31. New Zealand are 84/3 in 14.1 overs, 241 runs away from the target. Yuzvendra Chahal traps him LBW to claim his first wicket. 12:46 IST: FOUR! Ross Taylor ends the 14th over with a boundary. 12:43 IST: Kedar Jadhav comes into the attack. 12:38 IST: FOUR! A boundary to conclude the over. New Zealand 72 for two in 12 overs, need 253 runs to win. It was a shortish delivery from Vijay Shankar and Ross Taylor picks it up over the fine leg to get a boundary. 12:32 IST: India introduce spinner into the attack. Yuzvendra Chahal to bowl the 11th over. A slip in place. 12:31 IST: FOUR! Consecutive boundaries for Colin Munro and New Zealand. It takes the homes team to 63/2 in 10 overs. 12:29 IST: FOUR! There was a little bit of risk in that shot but Colin Munro brings back some confidence in the side with that boundary. 12:27 IST: Vijay Shankar comes into the attack. 12:26 IST: Bhuvneshwar Kumar bowls a maiden over. New Zealand are 53/2 in nine overs, 272 runs away from the target. 12:22 IST: Ross Taylor comes to bat at number four. 12:20 IST: WICKET! BOWLED HIM! Kane Williamson departs for 20. Mohammed Shami takes the revenge of successive boundaries. New Zealand lose their captain and second wicket in the chase of 325. The hosts are 51/2 in 7.5 overs. 12:19 IST: FOUR! Impressive footwork by Kane Williamson. The captain has taken the charge of the team in a tough chase. 12:18 IST: SIX! Back-to-back sixes from Kane Williamson bring some relief for New Zealand. 12:17 IST: SIX! What a shot! He pulls it over the fine leg to get a huge six. 12:14 IST: SIX! Bhuvneshwar Kumar bowls a short pitch delivery and Colin Munro pulls it with elegance over the fine leg for a six. New Zealand reach 31/1 in 6.3 overs, need 294 runs to win. 12:08 IST: Captain Kane Williamson comes to the crease. 12:06 IST: WICKET! Bhuvneshwar Kumar draws the first blood. Yuzvendra Chahal takes a catch at third man as Martin Guptill departs for 15. The New Zealand opener runs out of luck as he loses his wicket after getting three lifelines. New Zealand are 23/1 in five overs. 12:01 IST: Mohammed Shami concludes another economical over. Just two runs off it. New Zealand are 21 without loss in four overs. 11:56 IST: FOUR! Back-to-back boundaries keep New Zealand on track for tough chase. Martin Guptill follows it up with a lofted shot over the mid-wicket to get a boundary. 11:55 IST: Inside edge but FOUR! Martin Guptill is being lucky out there and New Zealand pick up easy runs. 11:53 IST: Mohammed Shami concedes just three runs. New Zealand are 10 without loss in 2 overs, need 315 runs to win. 11:49 IST: Mohammed Shami to bowl from the other end. 11:48 IST: FOUR! Colin Munro concludes the first over with a boundary. Buvneshwar Kumar bowls it quite short and wide and Munro guides it beautifully through the gap for four. New Zealand are seven without loss after the first over. 11:45 IST: Colin Munro and Martin Guptill are in the middle to start New Zealand's chase of 325 runs. Bhuvneshwar Kumar to open the attack for India. 11:02 IST: India score 324/4 in 50 overs. Rohit Sharma top-scored for India with 87 runs, while Shikhar Dhawan contributed with a 66-run knock. 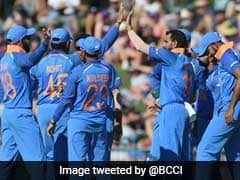 MS Dhoni (48*) and Kedar Jadhav (22*) were at the crease as India posted a strong total after opting to bat at Bay Oval. 11:00 IST: 14 runs from the first three balls of the last over. Certainly, Kedar Jadhav has a huge total in his mind. 10:59 IST: SIX! Top edge but the shortish delivery clears the fielder at fine leg for a six. 10:58 IST: FOUR! Kedar Jadhav lofts up the wide yorker over the cover for a boundary. 10:56 IST: SIX! MS Dhoni smashes a huge six to get into his forties and takes India past 300. 10:54 IST: FOUR! With two overs to go, Kedar Jadhav is trying to get quick runs for India. A poor ball from Trent Boult well punished by Jadhav. 10:50 IST: MS Dhoni dropped! Colin de Grandhomme is the culprit. India get a four and reach 287/4 in 47.1 overs. 10:44 IST: Kedar Jadhav comes to the crease. 10:42 IST: CAUGHT AND BOWLED! Lockie Ferguson strikes for New Zealand. Ambati Rayudu departs for 47. Rayudu fell three runs short of his 10th ODI half-century. India are 271/4 in 45.4 overs. 10:38 IST: Virat Kohli lost his wicket for 46, 45 and 43 in his last three ODIs. It seems he's struggling to reach his 49th ODI half-century. 10:33 IST: End of the over! Five runs from the over. India are 260 for three after 44 overs with Ambati Rayudu (44) eyeing his 10th ODI fifty. 10:27 IST: 250 up for India in 42.1 overs. Ambati Rayudu flicks it to the fine leg for a quick single. 10:23 IST: FOUR! Ambati Rayudu smashes it with the full face of the bat and guides it over the mid-off for four. 10:22 IST: FOUR! MS Dhoni hits it hard through the covers to gets his first boundary. India are 243/3 in 41.1 overs. 10:14 IST: MS Dhoni comes to the crease. 10:13 IST: WICKET! Trent Boult claims his second wicket, dismisses Virat Kohli for 43. It was a short length delivery from Boult that took a top edge off the Kohli's willow and Ish Sodhi makes no mistage at fine leg. India are 236/3 in 39.1 overs. 10:09 IST: SIX! Ambat Rayudu concludes the over with a huge six. 14 runs from the over by Colin de Grandhomme. India are 231/2 in 38 overs. 10:07 IST: 50-run partnership comes up between Virat Kohli and Ambati Rayudu. The third-wicket stand has put India back on top after losing their openers. 10:01 IST: End of the over! Five runs from the over by Colin de Grandhomme. India are 212/2 in 36 overs. 09:56 IST: FOUR! Doug Bracewell bowls a shrtish delivery and Virat Kohli predicts it well in advance and lofts it over the leg side for four. 09:55 IST: FOUR! 200 up for India in 34.1 overs. Remarkable footwork by Virat Kohli. The Indian captain punches it through the mid-off for a boundary. 09:51 IST: Time for drinks! It has been a highly successful session for India so far at Bay Oval. 09:48 IST: Colin de Grandhomme comes back into the attack. 09:44 IST: FOUR! Ambati Rayudu smashes it down the line to conclude the 32nd over with consecutive boundaries. India are 186/2 in 32 overs. 09:42 IST: FOUR! Ambati Rayudu edged but the ball goes wide of wicket-keeper Tom Latham. India get easy runs. 09:37 IST: FOUR! Sweet shot. Virat Kohli plays it with soft hands, guides the ball beautifully through the covers for a boundary. 09:33 IST: Ambati Rayudu comes to bat at number four. 09:31 IST: WICKET! Rohit Sharma misses out on a century and departs for 87. Lockie Ferguson claims the big wicket as Colin de Grandhomme takes an impressive catch at deep backward square leg. India are 172/2 in 29.3 overs. 09:26 IST: FOUR! Virat Kohli guides it to the fine leg and gets a boundary through a quick outfield. 09:24 IST: FOUR! It was a full length ball from Lockie Ferguson and Virat Kohli drives it beautifully through the covers for a boundary. 09:22 IST: Lockie Ferguson comes back into the attack. 09:18 IST: Trent Boult bowls a wicket-maiden over. India are 154/1 in 26 overs. 09:15 IST: Captain Virat Kohli comes to the crease. 09:13 IST: WICKET! Shikhar Dhawan departs for 66. This brings an end to the 154-run stan between the Indian openers. Trent Boult gives New Zealand a much-needed breakthrough at Bay Oval. With this, he completes his 400 wickets in international cricket. 09:10 IST: FOUR! 150 up for India in 24.2 overs. Excellent placement from Rohit Sharma. 09:02 IST: FOUR! Shikhar Dhawan deflects it comfortable through the fine leg for a boundary. 08:58 IST: Trent Boult is back into the attack and Rohit Sharma welcomes his with consecutive boundaries. 08:56 IST: End of the over! Back-to-back boundaries conclude 21 overs. 08:55 IST: FIFTY! Shikhar Dhawan scores his 27th ODI half-century off 53 balls. Shikhar Dhawan takes a double to reach the 50-mark, propels India to 116 without loss. 08:53 IST: 20 overs gone, India are 111 without loss in Mount Maunganui. 08:50 IST: SIX! Rohit Sharma hits it up over the top of the head of Lockie Ferguson at fine leg for a six. 08:46 IST: This is 14th century stand between Rohit Sharma and Shikhar Dhawan in ODI cricket. 08:42 IST: FIFTY! Rohit Sarma scores his 38th ODI half-century off 62 balls. He scored six boundaries and two sixes to reach the fifty-mark at Bay Oval. And that brings up 100 for Team India. 08:37 IST: End of the over! Just three runs from the over by Ish Sodhi. India are 93 without loss in 17 overs. 08:33 IST: Not out! The front foot of Rohit Sharma remained in the crease when Tom Latham stumped. 08:32 IST: Rohit Sharma stumped? 08:25 IST: FOUR! Shikhar Dhawan guides this one through the fine leg for a boundary. Both the openers look in good touch. 08:24 IST: FOUR! Shikhar Dhawan deflects it over the top of Martin Guptil for a boundary at deep backward point. 08:22 IST: SIX! Ish Sodhi bowls a short length delivery and Rohit Sharma pulls it over the mid-wicket for a six. India are 72/0 in 12.4 overs. 08:17 IST: Colin de Grandhomme to bowl from the other end. He last played an ODI for New Zealand in November 2018, against Pakistan in Dubai. Can he give the Blackcaps a much-needed breakthrough? 08:15 IST: Ish Sodhi concedes five runs in his first over. India reach 61 without loss in 11 overs. 08:13 IST: Ish Sodhi comes into the attack. 08:10 IST: FOUR! Both the Indian openers have figured out the surface too good for batting today. This time, Rohit Sharma impresses with a punch over the covers for four. 08:08 IST: FOUR! Fifty up for India in nine overs. Shikhar Dhawan plays it with full face of the bat and drives it down the the ground for a boundary. 08:05 IST: FOUR! Rohit Sharma picks it up a bit late but beautifully to send it across the boundary rope at fine leg. 08:02 IST: FOUR! Cracking shot from Shikhar Dhawan. A boundary from the moment he hit it. Doug Bracewell bowls it too wide of the off-stump and Dhawan smashes it into the gap for an impressive boundary. 07:59 IST: 2 runs! In the air... but safe. Diving Martin Guptill fails to take the catch at mid-wicket and India get a double. The visitors are 34 without loss in seven overs. 07:57 IST: Ferguson starts with an absolute ripper. It was a brilliant yorker that just misses the off-stump. 07:56 IST: Lockie Ferguson comes into the attack. 07:55 IST: FOUR! It was a short wide from Doug Bracewell and Rohit Sharma pulls it for a boundary. Just four runs from the over. 07:51 IST: End of the over! India are 27 without loss after five overs. Rohit Sharma (13*) and Shikhar Dhawan (12*) have given India a confident start at Bay Oval. 07:49 IST: FOUR! Shikhar Dhawan gets some quick runs for the team. He had scored an unbeaten knock of 75 runs in the first ODI against New Zealand in Napier. 07:45 IST: FOUR! Lovely shot. Rohit Sharma smashes it through the covers to get his third boundary. 07:41 IST: FOUR! Rohit Sharma hits it with a straight bat and the quick outfield gifts him a boundary. India are 15/0 in 2.2 overs. 07:39 IST: FOUR! Shikhar Dhawan concludes the over with a boundary. He deflects it down the leg side for quick runs, India reach 11 without loss after first over. 07:34 IST: Rohit Sharma edged again but the ball falls just short of Martin Guptill at second slip. Lucky Indian opener survives the first over by Trent Boult. 07:31 IST: Rohit Sharma EDGED! But FOUR! India get bonus runs on the first ball and New Zealand miss a big chance. Rohit gets off to the mark with a boundary, takes India to 4/0 in 0.1 overs. 07:30 IST: Openers Rohit Sharma and Shikhar Dhawan are out in the middle to start India's proceedings at Bay Oval. Trent Boult to open the attack for New Zealand. 07:28 IST: We are ready for the live action. 07:20 IST: "It's going to be a fair-surface. Hopefully, we can get something out of it first up. We have been playing good cricket. We have had some great games here. There is a lot of cricket, it's important to do the job with the ball in hand and then come back later to chase it down," says Kane Williamson at the toss. 07:15 IST: "We need to strengthen - put runs on the board. Ask bowlers to defend on dimensions which aren't regular for us. We need to know how to use the wind. We need to be smart about the areas we are going to hit. It's about giving ourselves a different challenge. We need to execute our plans," says Virat Kohli after winning the toss. 07:02 IST: TOSS! 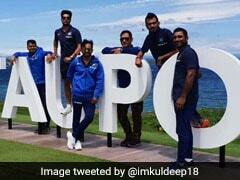 India win toss, opt to bat against New Zealand in Mount Maunganui​. India are unchanged while New Zealand are playing Ish Sodhi and Colin de Grandhomme in place of Mitchell Santner and Tim Southee respectively. 06:50 IST: Hello and welcome to our live coverage of the second ODI between India and New Zealand in Mount Maunganui. Hardik Pandya has left to join the squad in New Zealand after the Committee of Administrators (CoA) revoked the interim suspension on him and KL Rahul but most likely, he will be available only third ODI onwards. The team management played pace all-rounder Vijay Shankar at McClean Park but depending on the conditions, it can bring back Ravindra Jadeja. Ambati Rayudu, who scored an unbeaten 13 off 23 on Wednesday, is expected to get another opportunity following a not-so-productive run in the ODIs against Australia. For India, the biggest plus to come out of the first ODI was Shikhar Dhawan regaining some form with the bat following a lean run in Australia. The southpaw scored an unbeaten 75 in the team's comprehensive win and in the circumstances, it was a crucial knock. 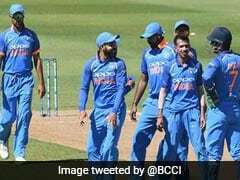 More changes can be expected in the eleven after Kohli takes a break following the third ODI on January 28, creating an opening for the likes of Shubman Gill to make their India debut. New Zealand won the previous home series against India 4-0 but could be heading towards a reverse if they don't up their game. It seemed captain Kane Williamson was batting on another surface as the batsmen struggled at the other end.